An act of terror brought down the Russian A321 airliner in Egypt last month, killing all 224 people on board, says Russia’s security chief Alexander Bortnikov. “Traces of foreign explosives” were found on debris from the Airbus plane, FSB chief Alexander Bortnikov told Russian President Vladimir Putin. Vladimir Putin vowed to “find and punish” those behind the attack over the Sinai peninsula. A branch of ISIS said it downed the plane. Nearly all the dead were Russians. Alexander Bortnikov said a bomb had been planted on board the Metrojet plane, equivalent to up to 1kg of TNT. The Kremlin website carried a transcript of the meeting. The bomb shattered the plane mid-air on October 31, he said, “which explains the wide dispersal of fuselage pieces”. Vladimir Putin said that Russia must hunt those responsible “indefinitely, find out who the individuals were”. Russia has offered a $50 million reward for information on the Sinai plane attackers. 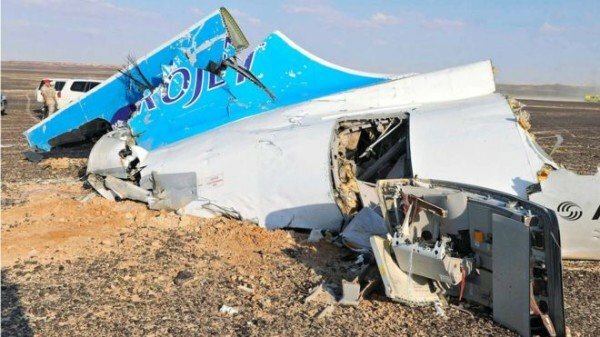 Sinai Province, a branch of ISIS, said in a statement on October 31 that it had destroyed the plane because of Russian air strikes in Syria. ISIS also said it was responsible for the multiple shootings and bombings in Paris on November 13 which killed 129 people and wounded hundreds more. Most of the A321 passengers were Russian tourists flying home from the Red Sea resort of Sharm el-Sheikh. Metrojet is the brand name of Kogalymavia, an airline based in western Siberia. Vladimir Putin said that Russia’s air strikes in Syria “must not only be continued – they must be intensified so that the criminals understand that retribution is inevitable”. Russian warplanes are supporting Syrian government forces against various rebel groups, including ISIS and other Islamists. Russia’s military commanders were also at the meeting with Vladimir Putin and the Federal Security Service (FSB) chief. Vladimir Putin was speaking after separate meetings at the G20 summit in Turkey, with President Barack Obama on November 15, and UK PM David Cameron on November 16. The Syrian conflict was the focus of their talks. The Sinai Province militants have operated in northern Sinai for two years, attacking Egyptian security forces, hundreds of whom have died in the violence.